This is rather an exciting post for me to be writing because I cannot believe how quickly this has come around. I remember a year ago being at home with all of my things packed ready to move out to uni and debating whether to start this little blog when I left. I plucked up the courage to do so on the 5th of September 2013 and I am so glad that I did because I love it! You will be able to work out that it is my blog birthday a month today and I wanted to do something special to give something back to all of you for being there alongside me! 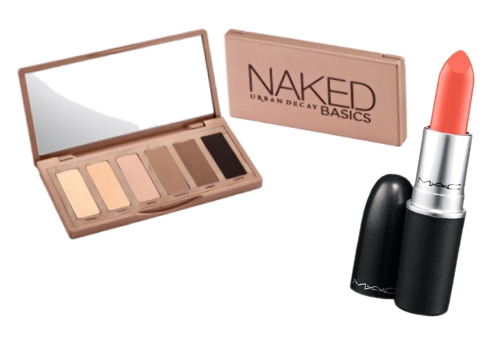 I am going to be giving away the Urban Decay Naked Basic palette and a MAC lipstick of your choice! I will leave the terms and conditions and what you have to do to enter below. I wish you all the best of luck and thank you for coming on this journey with me!! N.B- YOU NEED TO FOLLOW MY SOCIAL NETWORKING SITES TO SEE WHO HAS WON- THERE WILL BE NO ANNOUNCEMENT MADE ON HERE. 1. You need to be over the age of 16- if not you do need to ask for your parents or guardians permission. 2. The giveaway is going to be international - anyone can enter. 3. To win you need to be following my blog on here or on bloglovin here and you need to be subscribed to my YouTube channel here. 4. You need to leave a comment on this blog post sayingone thing like about my blog or how I can make it better and your favourite product that you use during the summer months! You also need to follow me on twitter here and include your twitter handles within the comments so that when I pick a winner I can DM you to notify you that you've won (I won't be able to DM you unless you follow)! 5. You also need to tweet about entering the giveaway! 6. Only enter a few times a day to avoid spamming the comments and you entry not being counted. 8. The giveaway will run for a month and will finish on the 5th of September, at midnight GMT. The winner will be notified on twitter, if you don't answer within 2 days then another winner will be selected. Hey Megan, I love your colourful header and I think your blog is lovely just the way it is, don't change it! I'm loving primers during summer otherwise my foundation melts away! Congratulations on being a blogger for a whole year! I loved your top 10 products for Summer post that you did a couple of months back! My Summer must have product is the Maybelline Dream Pure BB Cream as it is so light on them hot day when I want some coverage but don't want to have to wear heavy foundation! Happy almost blog birthday! That's amazing that you've been blogging for almost a year! Congrats! I love your blog design - it's simple but colourful and fun and it's easy to read! I love it! I would love to see a search button in your sidebar so it's easier to find certain posts that I'm looking for. Other than that, your blog is great! I love using BB creams in the summer as they feel light on my skin - perfect for the hot weather! Happy almost birthday to Beautiful you. My favorite thing at the minute is the essence CC cream but it's ever changing. Happy almost blog birthday! :) I love your blog layout, it's simple but pretty! I would love to see more posts related to make-up and this summer I'm loving to use the shimmer block bronzer from Vivo! :) My twitter is @silviabia41 Thanks for the lovely giveaway!! During summer months i like to use BB cream instead of applying foundation. I love the Skin7 and Missha BB creams ! I really love the design of ur blog..it is simple but so pretty and convenient. .during summer I use my sunscreen with spf..
You blog is amazing, keep the good work! Happy birthday! :) I love the layout of your blog and I like to see some makeup tutorials. :) My favourite product to use during the summer is the Covergirl outlast stay fabulous foundation 3 in 1, it's light & if I'm in a hurry I just put this on & good to go. I like the variety of posts you have including the more lifestyle orientated ones. I also like your uncluttered blog layout and your banner is beautiful! My favorite product to use during the summer months is Revlon ColorStay foundation as it stays on really well even in hot and humid weather. My favourite thing about your blog is the layout and how bright and colourful it is :) My favourite product for summer is Bourjois Happy Light Matte Primer, its definitely my summer essential! Enjoy your honest reviews! My fave summer product was a new summer scent for me ...... Dolce by D&G feels like summer every day regardless of the weather!! Hey, I love your blog! So happy 1st bloggers birthday! I love the fact that your blogger has a varied topics! So it's not all about beauty products for instance. The fact that you talk about yourself and your life allows me as the reader to connect and feel like I know you better! The only thing I could say to improve on is to blog more often! Your blog has great content, I just want to see more of it! I absolutely love your top 5 nail varnish blog! I love designing nail patterns, so incorporating the now in season summer colours are important! Keep up the fantastic blogging! I love your blog layout, it is very user friendly. Also love the banner & pastel background. The colors are so eye-soothing! My favorite summer product is a facial spray. I live in a very hot place, so a facial spray only saves my skin by hydrating & refreshing it throughout the day. I like the Evian one as it comes in a small sized bottle too that can fit in my handbag! I like that your blog is useful for 'normal' girls and that the products you review are affordable and easy to get your hands on. My favourite summer essential is Revlon's Lip Butter, keeps lips moisturized by with a nice colour, which you actually introduced me to. Hi, congrats on blogging for a whole year! I really love your header! as it's super colourful and bright!